Gripping, no? To my mind, that covers pretty much all of what you need know about the landing itself, although if you’re still curious, you can read more coverage here and here. Instead, I’m going to focus on a Canadian contribution, in the form of a particular scientific instrument on board Curiosity: the alpha-particle x-ray spectrophotometer (APXS). 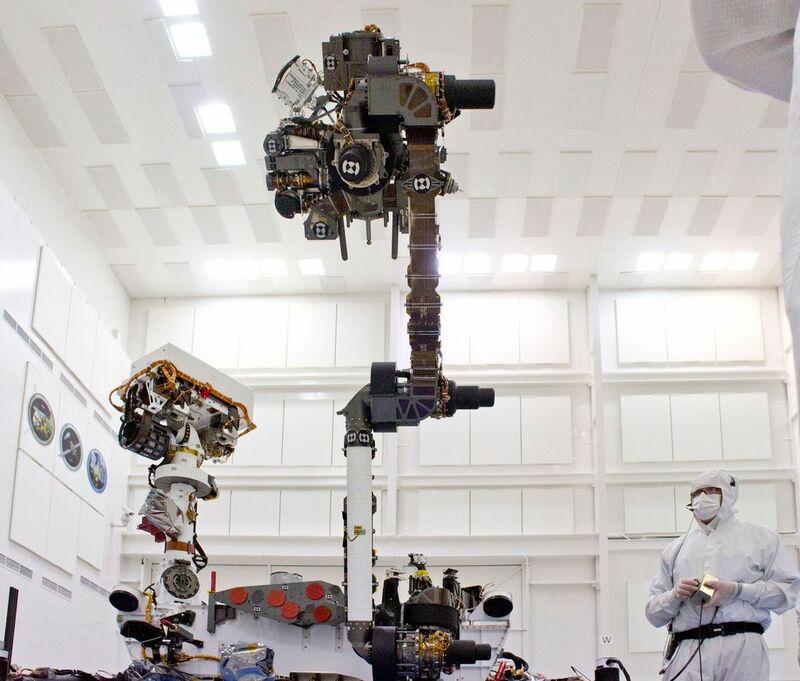 The APXS is a soup-can-sized device that probes the chemical composition of rocks that come within reach of Curiosity’s seven-foot robotic arm. It does this by using radioactive compounds such as curium-244 to fire alpha particles, protons, and x-rays at various martian minerals, then monitoring what flies off. For example, an alpha particle emitted by the device might bounce off the nucleus of an atom in a martian rock and hit a detector in the APXS. By measuring how much energy is absorbed in the collision, scientists can determine the size – and therefore the atomic number – of the element that the particle hit. Other processes used by the APXS involve exciting electrons in the sample to emit light in the form of x-rays. The wavelength of this light contains information about the atom’s electron configuration and chemical bonds. When assembled and interpreted by earth-bound scientists, the data gives a detailed description of what elements are present and in what quantities. On earth, APXS instruments are rarely used as there are faster techniques that don’t rely on radioactive materials to excite the sample. However, because the APXS is compact and requires very little energy to operate, it’s ideal for space missions. 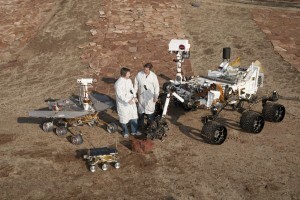 Both Spirit and Opportunity, NASA’s previous Mars rovers, contained an APXS, with which they were able to detect the presence of minerals like silica and various hydrated sulfates. These minerals form only in the presence of liquid water. The lead engineer on that project was Ralf Gellert, who is now a professor of physics at the University of Guelph. For Curiosity, he helped design of a new APXS that is faster, tougher and several times more sensitive than the those used on the last generation of rovers. While the past existence of liquid water on the martian surface has long been established, Gellert hopes that the APXS on Curiosity will be able to shed new light on its exact nature. “From orbit, it’s been predicted that the Gale Crater contains clays, as well as sulphates,” says Gellert. “Sulphates indicate very acidic water. Clays, on the other hand, form in more neutral water at a higher atmosphere pressure.” If Curiosity does find evidence of clays, it would indicate an ancient martian environment much more like that which supports life on Earth today. 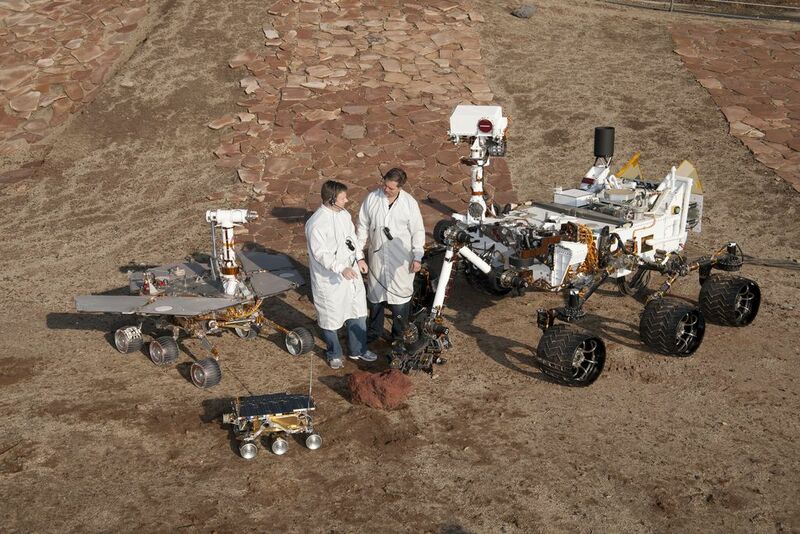 The Mars Science Laboratory is a huge international collaboration; other Canadian scientists are helping to drive the rover around on Mars or analysing the data as it comes back from space. While tonight’s ‘seven minutes of terror’ will undoubtedly be memorable, it’s the months and years to come that will hold the real scientific treasures. In the meantime, questions about whether Mars once harboured life – or whether it might do so in the future – will remain unanswered. Hat tip to the Science Media Centre of Canada for the quotes used in this post. Many groups have organized parties to watch the Curiosity landing: some are planned for Toronto, Montreal and Winnipeg.